Spooked by indications that a private company is seeking to operate Baltimore’s water system, the City Council is set tonight to pass a measure to keep the region’s water and sewer operations public. Mayor Catherine Pugh says she supports the charter amendment, which has drawn support from municipal unions concerned about lost public-sector jobs and ministers worried about the impact of rising water rates on the elderly and poor. Ironically, the ban on privatization obscures the fact that Baltimore’s water and sewer system already operates much like a private entity with remarkably few checks and balances. The city’s municipal water policies are ostensibly intended to provide an essential service. But they’re also designed to capture maximum revenue to satisfy private bondholders and to fund capital projects determined by a relative handful of engineers and consultants. Back in November 1978, city voters approved a charter amendment that designated municipal utility operations as “enterprise” funds. The amendment removed the water and sewer systems from the annual budget process and required them to be financially self-sustaining. Ironically, a ban on privatization obscures the fact that Baltimore’s water and sewer system already operates much like a private entity. Ordinance 941, subsequently approved by the City Council, put a new mechanism in place for determining how much households and businesses would pay for water services. Rate determinations were placed in the hands of the Board of Estimates, and especially the director of Public Works, who sits on the spending board. If projected future costs outran projected future revenues, the board could raise rates at the recommendation of the Public Works director with the concurrence of the Finance director. In short, Baltimore’s water system became as profit-oriented as any private company (although, technically, it could not produce a profit, only a surplus). It was a monopoly of hundreds of millions of gallons of water and thousands of miles of underground pipes free of any competition. The administrators of the water system – unlike, say, Baltimore Gas & Electric – were not required to justify their expenses and proposed rate hikes to state regulators. Indeed, the director of Public Works could recommend the rates he wanted – then could join the mayor and the Board of Estimates in approving those rates. The retail price of Baltimore’s water and sewer services remained flat for more than 20 years after the charter amendment and Ordinance 941 were approved. Then came a decade of reckoning. DPW was faced with enormous new costs to end its longstanding practice of diverting sewage into streams and the harbor during heavy rainfalls. On the heels of the federal crackdown on illegal sewage, the city was faced by a new EPA rule requiring drinking water stored in reservoirs to be covered or placed in water tanks. Currently, the city has $1.655 billion in outstanding bonds for water improvements and $1.192 billion in sewer improvements. The costs of these bonds – and their interest – come straight out of the pockets of ratepayers. 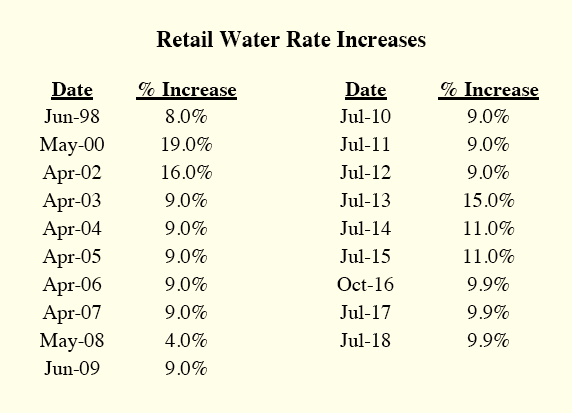 Not surprising, then, the price of water and sewage in Baltimore City has more than doubled in the last 10 years and tripled since 1998 (see Retail Water Rate Increases below). 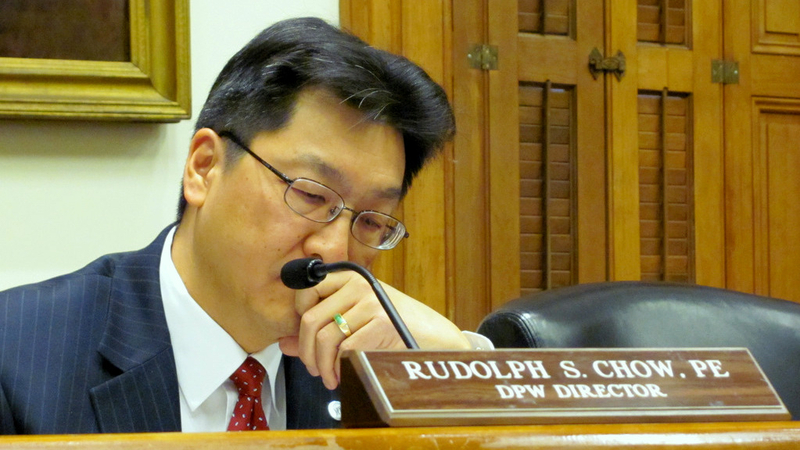 Under the current enterprise fund set-up, DPW’s current director, Rudy Chow, has huge discretion over spending, with limited accountability to the public. 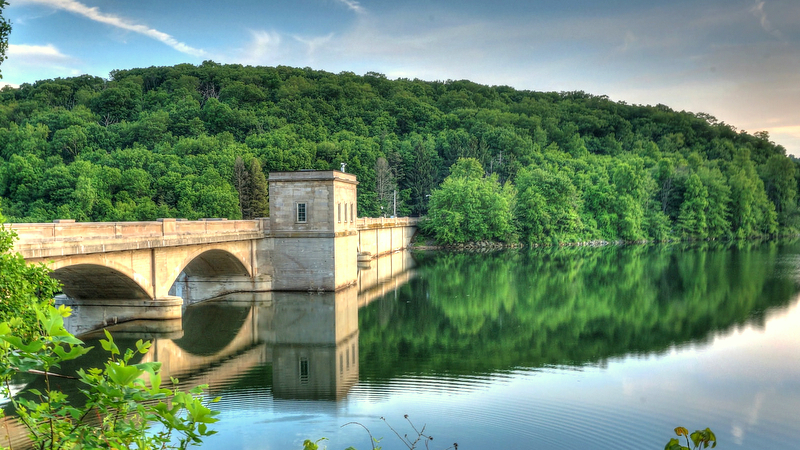 Take the $275 million Druid Lake and Hanlon Park water storage projects. Getting basic facts about the projects has proven difficult for the City Council. Chow did not appear at a Council hearing about the two projects, which have been beset by construction problems and community demands for better environmental controls (here and here). Councilman Leon F. Pinkett III, who represents the impacted communities, has yet to receive full answers to questions he has asked of Chow’s engineering and construction staff. Last year, United Water, a subsidiary of the French conglomerate Suez Environment, floated a plan to operate Baltimore’s water and sewer system for 40 years. It pledged to keep future water rates at roughly the level of inflation, retain the current workforce and honor union contracts. The city would remain the owner of all water and sewer assets. Despite such promises, in some jurisdictions where private equity firms have taken over public systems, rates were not kept under control. They rose nearly 28% in Bayonne, N.J., after the Wall Street investment firm Kohlberg Kravis Roberts teamed up with United Water to manage the system, according to the New York Times. Rates rose there and in two California cities that moved to privatize water, a Times analysis found. The clamor over privatization has also drowned out a rational discussion about how to finance costly infrastructure improvements. In Baltimore, opponents have warned that leasing or selling the water system would lead to higher rates, deteriorating service and fewer jobs. Those warnings appear to have put a halt to the city’s flirtation with United Water and other entities. But the clamor over privatization has also drowned out a rational discussion about how to finance costly infrastructure improvements. And it’s put a damper on examining how well DPW is serving the public as opposed to fulfilling its obligations to bondholders. • Could a regional water authority be a more effective platform for ensuring safe, affordable drinking water? • Could an independent board offer better checks on the billions of dollars to be spent on future sewer and water projects? • Does the present system provide enough safeguards for the poor and elderly faced with water shutoffs that can cause tragic repercussions? That’s a conversation we need to have. – Fern Shen contributed to this article.